Just when we though Oak Tree Road couldn't support any more Indian restaurants, six new restaurants have come up in the Flavor Junction food court on the second floor of Kumar Soni Plaza. With so many choices cheek-by-jowl, our biggest confusion at the new food court was where to eat. Dining options at the Flavor Junction food court include South Indian, Indian-Chinese, Chaat, Gujarati, North Indian and Lassi. After looking around at the various options, we picked Hyd Bawarchi for our meal. After a quick look at the menu board, we placed our order for Mysore Masala Dosa ($5.00) and Idli/Vada combo ($4.00) for dine-in and Egg Biryani ($9.00) for takeout. Like at any Food Court eating joints, you place your order, pay for the food and wait at a table for it to get ready. As we were about to pay with our credit card, the Indian fella at the cash counter told us it was cash only since the credit card machine had yet to be set up (we visited in late Feb. 2012). Our order of Mysore Masala Dosa came first followed by Idli-Vada Combo. 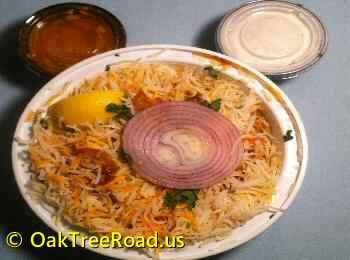 By the time we finished the Dosa and Idli-Vada our takeout order of Egg Biryani was ready. To put it succintly, Hyd Bawarchi serves overall Good Indian Food. 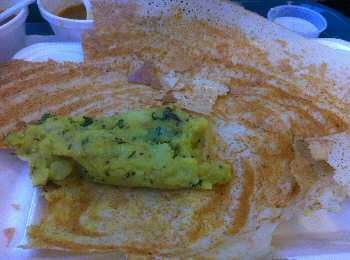 Unlike a regular Masala Dosa, the Mysore Masala Dosa comes with a red chilly paste smeared to the inside of the Dosa lending a spicy taste to the rice crepe. Our order of Mysore Masala Dosa came with Coconut Chutney, Onion-Red Chutney and Drumstick Sambar. There were several things we liked about our Mysore Masala Dosa. First, the price. It was just $5.00. 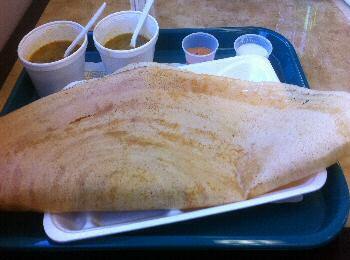 Second, Mysore Masala Dosa was big, thin and crisp. Third, the masala paste was evenly smeared inside the dosa, just the way we like it. Fourth, the Potato filling though small was flavorful. Fifth, the medium thick Drumstick Sambar was hot and delicious. Sixth, the accompanying Coconut and Onion Chutneys were flavorful and, more importantly, they were not freezing cold. While we enjoyed the Mysore Masala Dosa, we would like our Dosa to be a little more hot temperature wise. It was just warm when it arrived at our table, a few feet from the kitchen. As we were halfway through our Mysore Masala Dosa, our Idli-Vada Combo landed on the table along with Drumstick Sambar, Coconut Chutney and Onion-Red Chutney. Idli-Vada combo included two piping hot Idlis and a medium-sized Vada. Idli was featherlight, fluffy and soft. Heaven, man, heaven. 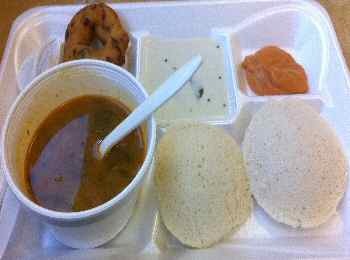 We thoroughly enjoyed the Idlis with the sides of the two Chutneys and Sambar. While Hyd Bawarchi's Idli was nonpareil, Medhu Vada was a bit of a disappointment. Medhu Vada was not crisp as it ought to be. It was too soft but still tasty because of Chopped Onion, Cilantro, Black Pepper seeds seasoning. Second, it was way too small. When we pay $4.00 we expect at least three idlis and a big, crisp Vada. Egg Biryani exuded an enticing aroma. But it smelled better than it tasted. The Egg Biryani came with two boiled eggs divided into four pieces, a slice of raw onion on top and a slice of cut lime. The texture of the rice was fine, no cause for complaints there. But the Biryani was a bit underspiced. And the Egg Biryani did not have any vegetables like cut Beans or diced Carrots. It just included rice and two boiled eggs. The serving size is also small for $9.00. Gravy was watery and had Peanut flavor. Onion Raita was medium thick with Cilantro leaves seasoning and was alright. While we put Hyderabad Biryani Bawarchi's Egg Biryani in the decent category, it's no match for heavenly Dakshin Express Biryani, which comes in a larger serving size at a lower price. Ordering food at Hyd Bawrchi was a breeze. The tall, lean indian waiter was polite and handled our order with attentiveness. It was refreshing to see a waiter at an Indian restaurant with a smile pasted on his face. Waiters at Indian restaurant often sport a mournful mien or constipated look. 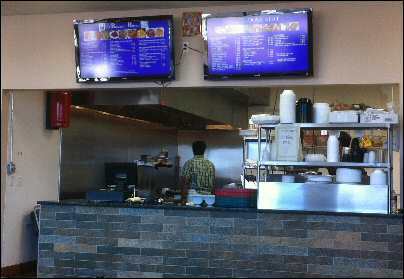 Sure, there's plenty of choice on Oak Tree Road for aficonados of Indian food. If you love Dosa like us we recommend Hyd Bawarchi. For Dosa Treat's Dosas are reasonably priced. The place offers a huge selection from Plain Dosa to Mysore Masala Dosa to Andhra Special Pesarattu and MLA Dosa and more.